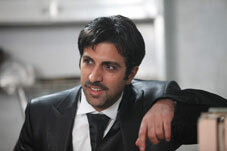 The latest film of the seasoned Iranian director follows The Boss, which received negative points from most critics. Kimiaei is one of the most prominent directors of the Iranian cinema who has started his career 40 years ago. Although his post-revolutionary films have not been as successful as his early films, his works have been always controversial. When he is going to make a new film, everybody is curious to know about actors and other crewmembers. He has chosen actors of his new film out of young figures. Some of them have already worked with him while others have had their first experience with Kimiaei. Trial on the Street features Mohammad Reza Foroutan, Niki Karimi, Poulad Kimiaei, Negar Forouzandeh, Shaghayegh Farahani, Arzhang Amirfazli, and Hamed Behdad with Touraj Mansouri as director of photography. Mansouri, who has worked in recent years with different directors including Majid Majidi (Song of the Sparrows), Massoud Dehnamaki (The Expelled 2), Dariush Mehrjui (The Dulcimer Player), and Ebrahim Hatami-Kia (Invitation), is turning into a stylist cinematographer. Other crewmembers include Eshaq Khanzadi (sound recordist), Reza Mehdizadeh (production designer), and Mohammad Qowmi (makeup artist). Kimiaei is also producer of his new film. The story is about marriage between Amir and Marjan. Habib, a friend of Amir, who has been urging him to marry Marjan, suddenly changes his mind and asks him to walk out of the wedding. Habib knows that Marjan has been already married to another man and has a child by him. Amir’s sole clue is an address. Like other Kimiaei’s films, friendship between the two men is the axial theme. Trial on the Street runs on a two-hour story. The initial plot has been written by Asghar Farhadi, but since his screenplay has been substantially changed, his name is not on the credits.